Old classic re-upload : Adds an underground house to the flank of a mountain in Balmora. I'm not the author (Simstar is) and this is a re-upload of a mod that I used for a house back then. 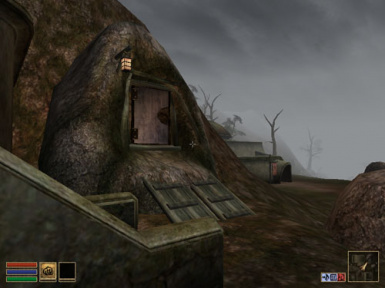 This mod adds an underground house to the flank of a mountain in Balmora. There's plenty of storage, wooden statues/mannequins to show your armors, a dummy to train, an alchemy room and it's accompagned with its own optional teleport Add-on. This mod, which dates from 2002, was a former PES Hall of Fame back around 2006. 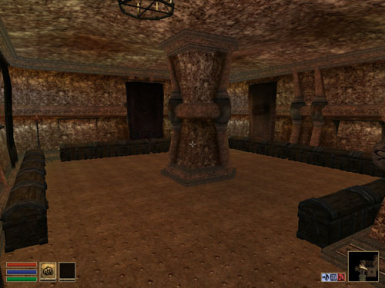 This mod creates a nice underground place to stay, located in NW Balmora (-3,-2) between the temple and the "Fine Alchemy" shop. It has several rooms with good atmosphere and more than sufficient storage. The mod is for real roleplayer's and has NO tons of loot inside that you can sell, NO NPC shops that have tons of gold. NO tips or spoilers. Updated version: Ver. 1.8 has had many items added, framerate increased, more storage space; teleporting (separate esp for the purists) see readme for complete info.